Try not to get the quiz answers wrong… Each wrong answer makes Baldi angrier…. 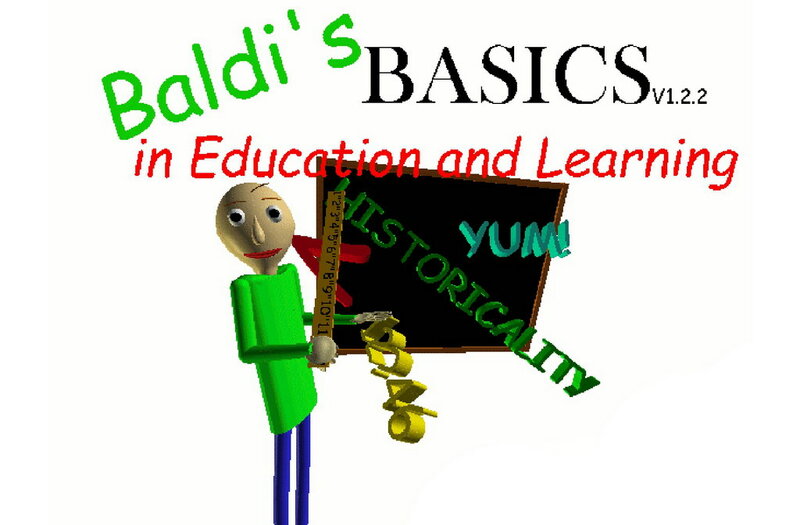 Baldi’s Basics in Education and Learning is a creepy indie, adventure game made by Micah McGonigal. The player is a student at Baldi’s Schoolhouse, whose goal is to collect and fill out seven notebooks scattered about the campus. Find and use items to your advantage. Inspired by creepy/bad edutainment games from the 90s (Sonic’s Schoolhouse, I.M. Meen, 3D Dinosaur Adventure: Save the Dinosaurs), this game starts out seemingly innocent enough, but it quickly becomes clear that this isn’t edutainment. Collect all 7 of the notebooks and escape the school, all while avoiding Baldi. Baldi's Basics is a quick indie horror game styled after old edutainment software from the 90's. It begins as a fairly typical quiz game, but soon the questions become impossible to answer. Baldi has many friends in the school that will slow down your progress and put you at risk of being caught, so learn how each character works and how you can avoid their attention. After you inevitably fail the third question, the plot changes to a horror as you are chased around the school.